For over six years we have kept the readers of the Puna News up to date on environmental issues and explained our position on them through this monthly column. Upcoming events of special interest to residents are also announced. We were invited to do a presentation to the 1st and 2nd graders about the differences between plants and animals and how they all arrived here in Hawai‘i. We used lots of pictures and a potted native plant, and donated a series of environmental posters (courtesy of the Conservation Council of Hawai‘i) to the school. They later sent us a bunch of drawings as a mahalo. The newest branch of the Rotary asked us to do a presentation on the hot issue of releasing the scale insect, T. ovatus, to help control the spread of strawberry guava. As a result, Rotary members decided to schedule their very first workday in the Wao Kele O Puna, doing weed control and seeing for themselves the extent of strawberry guava infestation and its impact on our native forest. We partnered with the Kanaka Council to put on two of these all day events – in May and November. Featured were talks, demos, and exhibits about the various areas of sustainability: Food and Agriculture, Water, Energy, Transportation, Health and Healing, Shelter, Solid Waste and Recycling, Traditional Knowledge and Green Jobs/Right Livelihood. Malama O Puna’s exhibits had information about sustainable plantings, invasive species, and our organization, and we had lots of useful plants for sale. 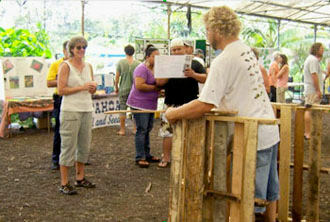 Although the November Expo was hit by a major rainstorm, the hardy people of Puna turned out to learn and share information. 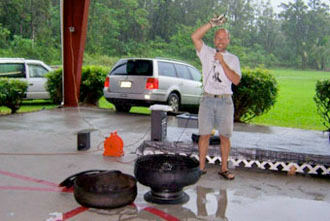 The next Expo will be held on May 1, 2010 on the campus of Kamehameha Schools in Kea‘au in conjunction with their annual Ho‘olaule‘a. Photos of Tim showing how to turn wooden pallets into planting tables (May) and Charlie demonstrating how to turn old tires into useful planters (November). Three of our Board members, Ann, Mitzi and Mark, attended this conference in Honolulu and did a poster presentation about our work eradicating red mangroves to protect the Wai ‘Opae MLCD (makai of Vacationland) and its coral gardens and marine life. There was considerable interest by scientists and environmentalists about the techniques, protocols, and herbicide types, minimal dosages and methods of delivery that we had found to be effective and affordable. On a near-zero budget we have been slowly creating what will someday be a beautiful educational park on this 9-acre parcel in Nanawale Estates. This year we have worked to control invasive plants moving in from neighboring parcels, and done some planting while at the same time engaging in a massive propagation project (thank you David) for eventual out-planting. The Department of Public Works called to arrange a site visit with us, asking for our recommendations of native trees suitable for the area and their planting needs. We gave them a list and also a list of possible nursery suppliers. Mark also planted some kukui and wauke on the berm. We are glad that DPW is willing to ask for info outside of their ‘skill set’ – education is a large part of what we do. For the last six years we have sponsored this program for Puna youth ages 8 to 18, and some of our graduates are now grown up and working as water safety officers. Besides basic lifeguard skills we also teach malama aina and civic responsibility. In 2009 we conducted two series of classes, supported by a mini- grant from our Councilwoman, which covered volunteer/ mentor mileage and provided healthy lunches. Mark is program coordinator and René plans menus and prepares the lunches. Volunteer Brian Jordan demonstrates treatment of shock victim (note elevated feet). We had 4 workdays and eradicated hundreds of seedlings to 4-feet and over 50 trees. Every time we have to travel deeper into the forest to find miconia, so our efforts are bearing fruit (pun intended). We began this project at the Wai ‘Opae MLCD, aka the Vacationland tide pools, with permission from DLNR and County Planning, as well as property owner, the late Stanley Hara. Funding came from the Hawai‘i Tourism Authority and the US Fish and Wildlife Service (USFWS). We enlisted students from Kua ‘O Ka La, Hilo High’s Jr. Greenpeace, and Dragonfly School as a learning service project. We also used volunteers and hired some people locally. Mangroves provide many environmental benefits in areas where they are native, but here in Hawai‘i they are destroying our coral reefs and the native marine life that depends on them. We worked out the most effective means of controlling this tree, using the minimal amounts of marine-approved herbicide, and were successful on our initial 300+ acres using volunteers. But the area kept getting re-infested as mangrove propagules from up-current drifted down on the tide and established themselves. USFWS then asked us to identify other locations of mangroves on the Big Island and offered us a grant to eradicate them, in order to prevent new populations. For us this meant, for each location, applying for SMA minor permits, getting approvals from property owners and other government agencies and then complying with everyone’s guidelines. Whew! Since it was more work than volunteers could handle, we contracted with Big Island Invasive Species Committee to hire their trained field labor, and the payroll is being handled by the UH-Manoa Botany Dept. We hope to be able to announce complete success by this time next year. The Puna rainforest encompasses over 27,000 acres and is our island’s major watershed. It is now listed under the federal Legacy Lands Act, is owned by OHA and protected in perpetuity. But prior to that it was subjected to development in the quest for geothermal energy, and the road that was built to intrude 3 miles into the heart of the forest brought with it an invasion of weeds, including strawberry guava, buddleia, albizia and many members of the Melastome family, including miconia, clidemia hirta, tibouchina and others. These were crowding out and killing the native trees and understory on which our native forest birds rely. With a grant from OHA that allowed us to tackle the most critical sections, we were able to stem the tide of infestation to a minor degree. Now OHA has hired Julie Leialoha to be their forest manager and create a restoration plan, and we are glad that we were able to mark the most important areas so that she can proceed with this enormous task. This became a very hot and contentious issue this year, fueled by a well-organized misinformation campaign that was not averse to using scare tactics. The scale insect, T. ovatus, has co-evolved with strawberry guava over thousands of years in its native Brazil, has not ‘jumped’ to any other species or caused problems to human health, has been tested for almost 20 years on related and other species prior to the proposal to release, and will not eradicate its host tree. All it will do is slow down the rate of reproduction. When we saw the impact of strawberry guava on our native forest, with no other viable control options, we supported the release of T. ovatus. This did not make us popular in some circles. We have opposed the continued development on Mauna Kea for a variety of reasons, the least of which was that the decision had already been made and the public hearings were merely a formality. The lack of a Comprehensive Management Plan (mandated in 1985 and only approved this year after so much development had already taken place) that was truly comprehensive (we have a long list of flaws), the conflict of interest in putting the UH fox in charge of the hen house, the history of violations of law and of environmental and cultural systems previously allowed and perpetuated by the University, and a procedure that eliminates future public input into the details of the plan and of the future of our sacred mountain, all send up red flags for us. In 1993 a now-defunct pseudo-environmental group on the mainland, heavily funded by the Exxon Corp. and with the goal of dismantling the Endangered Species Act one species at a time, submitted a petition to remove the ‘Io (Hawaiian Hawk) from the protection of the ESA. The US Dept. of the Interior then had to go through the process as defined by the act. The population figures they used were estimated and not based on any real studies; the original range encompassing all the main islands was not considered; archaeological evidence of the latter was not considered; threats to the ‘Io such as human-caused and natural disasters were not considered; and this was topped off by a misinterpretation of Hawaiian land use rules and procedures; all led Interior to conclude that the ‘Io should no longer be listed. We disagreed and offered point-by-point testimony to Interior to the contrary. We also crafted Resolutions for the State legislature and the County Council requesting that Interior keep the ‘Io listed. The County reso passed unanimously. The State reso never even got to committee. We still await Interior’s ruling as of this writing. Board and members of MOP inputted into the plan for over two years. René helped to push through its passage when she sat on the Planning Commission and testified in favor before the County Council. She then applied for a position on the Action Committee, and though she wasn’t selected, at least one MOP member was. René has already testified to the Action Committee and fully intends to take part in its work. While MOP has not taken the lead on this issue, we have attended the meetings and offered advice and suggestions, some of which are being seriously considered. We have submitted testimony on both the State and County levels in favor of a moratorium on the genetic modification of taro. Besides the Hawaiian cultural issues, which we respect, we are strongly opposed to open field growing/testing of GMO crops in Hawai‘i because despite assurances there have already been ‘accidental’ releases and contamination of non-GM and organic crops. GM is NOT the only way to protect crops from pests and diseases – there is a method that has proven sound and effective for thousands of years – practically since the inception of Agriculture – called selective breeding. Selective breeding also allows for, indeed requires, seed saving and continued sustainability, where as GM crops must purchase seed every season from Monsanto or their ilk. The refusal of the GM establishment to allow labeling so that consumers can ‘vote’ at the market, is also a cause for concern. The County Council passed the moratorium, but the State Legislature did not. We submitted testimony to the Water and Land Committee on SB 2316 in support of a perimeter fence to protect the Mauna Kea Forest Reserve from feral ungulates. We also asked the Senate Committee on Energy and the Environment to pass SB 2404 – the inspection fee bill relating to invasive species. This bill was designed to fund increased inspections as a pro-active means of keeping new infestations from gaining entry to our State. When DLNR proposed some changes to their administrative rules, tightening up their ability to enforce civil violations to our natural resources, we submitted testimony in approval, but also made some additional suggestions, regarding who does the post-violation mitigation, that the penalty should cover the entire cost of the mitigation and not be a flat fee, creating disincentives for potential violators, adding denial of permits for a set period in addition to monetary fines, and making heavy equipment operators equally responsible for grubbing/grading when there is no permit. And finally, we told the DOA Plant Pest Control Branch that we approved their proposed amendments of the coquí, little fire ant and nettle caterpillar to their ‘Pests for Control or Eradication’ list. We also asked them to come up with some generic wording to allow more rapid response to new species to avoid the time lag that now creates delays, such as what has happened with the varroa mite attacks on feral bee colonies in East Hawai‘i. MOP has been awarded Recycle Hawai‘i’s 2009 Keeping It Green Award “in recognition of your commitment to promote environmental protection and awareness and to implement sustainable practices in our community”. Nominees had to meet 3 out of 12 criteria – MOP met all 12. Every year there are 8 nominees for this award, which honors women as role models and for their community service. This year 3 of the 8 were from Puna District, 2 of whom were MOP members, and 1 (Madie Greene) made it to the top. We are so proud. Before they had even received their non-profit status from the IRS, we were able to help this grassroots- created acute care facility at the P?hoa Marketplace get off to a running start by acting as their fiscal agent so they could receive a $170,000 county Human Services grant. Since their inception in February they have seen about 3,000 patients, 6 days a week including holidays. We are proud that we were able to help PCMC bring much needed access to health care to our Puna makai community. Our bylaws require us to approve the Annual Treasurer’s Report and the Budget for the upcoming year at our first Board of Directors meeting, held on the second Wednesday of January. This means that we cannot provide you with the information until then. It will be available to any of you who are interested, upon request. Just email us with Fiscal Report Request in the subject line and we will be happy to send it to you.